as by the obstacles which [one] has overcome while trying to succeed." The National Institutes of Health's (NIH) Office of Equity, Diversity and Inclusion joins the Nation in commemorating Black History Month. 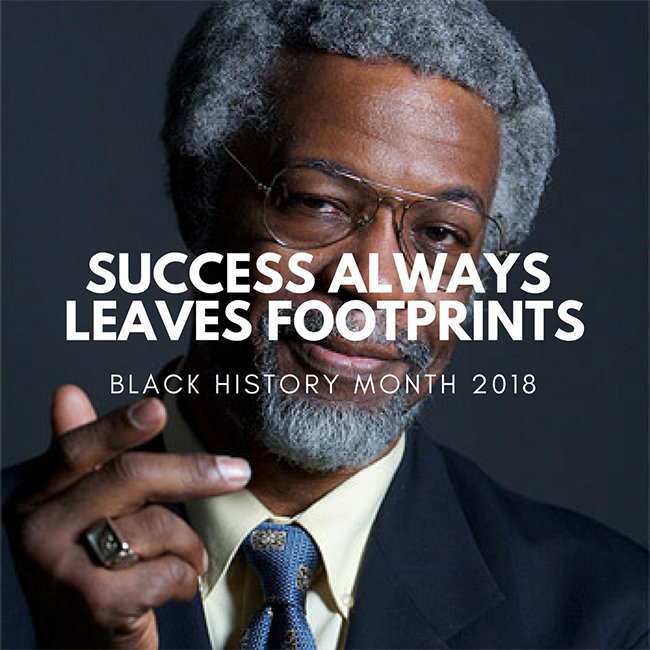 Our theme is "Success Always Leaves Footprints." It celebrates the numerous accomplishments and the meaningful legacy of Blacks throughout history. Our footprints, like legacies, encourages upcoming generations in recognizing the importance of lifting others and being proud of their heritage. What we see, what we do today and in this moment, will inevitably become a footprint in history. Our lives must not only be defined by what we do with what we learn, but also by the discoveries that come from what you create with the things you learn. These Black Americans have and are presently leaving footprints for the future. We are proud to recognize them this month and each day of the year. Shirley Jackson is a physicist and the eighteenth president of Rensselaer Polytechnic Institute. She is the first African-American woman to have earned a doctorate at the Massachusetts Institute of Technology (MIT). She is also the second African-American woman in the United States to earn a doctorate in physics. David Satcher is a physician and public health administrator. He was a four-star admiral in the United States Public Health Service Commissioned Corps and served as the 10th Assistant Secretary for Health, and the 16th Surgeon General of the United States. Lisa Gelobter is the chief digital service officer at the U.S. Department of Education. Before she joined the White House, she had a variety of experiences in media and entertainment. She led digital at Black Entertainment Television for five years and helped launch Hulu. Philip Emeagwali is a Nigerian computer scientist. An Igbo, he won the 1989 Gordon Bell Prize for price-performance in high-performance computing applications, in an oil reservoir modeling calculation using a novel mathematical formulation and implementation. Joseph Graves is a professor and the Associate Dean for Research and Professor of Biological Studies at the Joint School for Nanoscience and Nanoengineering. Using his background in evolutionary biology, he has also written two books that address myths and theories of race in American society. He has been a Principal Investigator on grants from the NIH, National Science Foundation and the Arizona Disease Research Commission. Barbara Ross isn't famous for singing like her sister Diana Ross, but she is a star in her own right. Dr. Ross-Lee is the first Black woman appointed as dean of an American medical school, along with other honors and accolades. Frederick Jones was an inventor, entrepreneur, winner of the National Medal of Technology, and inductee of the National Inventors Hall of Fame. His innovations in refrigeration brought great improvement to the long-haul transportation of perishable goods. Emmett Chappelle is a scientist who made valuable contributions in the fields of medicine, philanthropy, food science, and Astrochemistry. Marian Croak is a pioneering woman in the field of technology who has continuously defied the odds and encouraged others to do the same. She manages more than 2,000 world class engineers and computer scientists, and she is responsible for more than 500 programs impacting AT&T's enterprise and consumer wireline and mobility services. Charles DeWitt Watts was a surgeon and activist for the poor. Watts was the first surgeon of African American ancestry in North Carolina. Earning his medical degree in 1943 from Howard University College, he was the first African American board-certified surgeon to serve in North Carolina. Breaking the social customs of racial obstacles, he advocated for certification of African American medical students. He served as chief of surgery at Durham's Lincoln Hospital and was later one of the key figures in converting it to the Lincoln Community Health Center, a low-priced clinic for the poor. Neil deGrasse Tyson an astrophysicist, author, and science communicator. Tyson served on a 2001 government commission on the future of the U.S. aerospace industry, and on the 2004 Moon, Mars and Beyond commission. From 2006 to 2011, he hosted the television show NOVA ScienceNow on PBS. Since 2009, Tyson hosted the weekly podcast StarTalk. A spin-off, also called StarTalk, began airing on National Geographic in 2015. The U.S. National Academy of Sciences awarded Tyson the Public Welfare Medal in 2015 for his "extraordinary role in exciting the public about the wonders of science". Louis Wade Sullivan is an active health policy leader, minority health advocate, author, physician, and educator. He served as the Secretary of the U.S. Department of Health and Human Services during President George H. W. Bush's Administration and was Founding Dean of the Morehouse School of Medicine. Marie M. Daly Clark is best known for being the first African-American woman to receive a Ph.D. in chemistry in the United States. Percy Lavon Julian was an African American research chemist and a pioneer in the chemical synthesis of medicinal drugs from plants. He was the first to synthesize the natural product physostigmine, and a pioneer in the industrial large-scale chemical synthesis of the human hormones progesterone and testosterone from plant sterols such as stigmasterol and sitosterol. His work laid the foundation for the steroid drug industry's production of cortisone, other corticosteroids, and birth control pills. Valerie Thomas is a scientist and inventor. She invented the Illusion Transmitter, for which she received a patent in 1980. Arlie Oswald Petters is a mathematical physicist, who is the Benjamin Powell Professor of Mathematics and a Professor Physics and Economics at Duke University. Petters is a founder of mathematical astronomy, focusing on problems connected to the interplay of gravity and light and employing tools from astrophysics, cosmology, general relativity, high energy physics, differential geometry, singularities, and probability theory. Sylvester James Gates Jr. is a theoretical physicist who works on supersymmetry, supergravity, and superstring theory. He retired from the physics department at the University of Maryland College of Computer, Mathematical, and Natural Sciences in 2017, and he is now the Ford Foundation Professor of Physics at Brown University. He was a University of Maryland Regents Professor and served on former President Barack Obama's Council of Advisors on Science and Technology.